For many years, I’ve been hearing many great things that the Allentown Rescue Mission does for the homeless. I’ve learned of their charitable efforts from their regular exposure on our local IDWraps.com partner AM radio station (WAEB.) 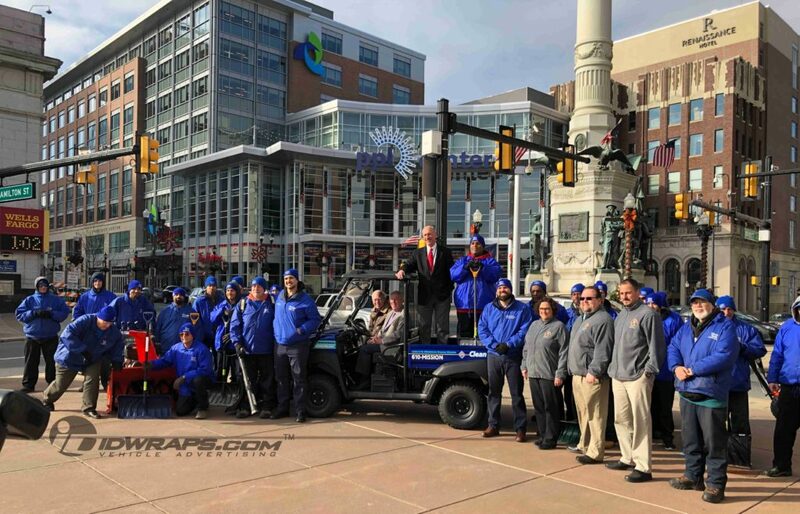 Here’s an Allentown wrapping project story that IDWraps.com was fortunate to be part of. This Fall, I had the opportunity to work with the Rescue Mission’s Clean Team when moving my father’s business. The Clean Team is the Missions outlet for providing jobs for individuals. The program teaches them how to work their way out of homelessness. It’s not all just about cleaning and moving though. The Clean Team also offers interior demolition, light landscaping, carpet removal, interior painting, floor waxing, and nearly anything labor related. As for my father’s project- not only did they have the best moving/general labor rates in our market, but they also provided a box truck with a lift gate for each day of the move. The 3 man team sent were professional and kept a very steady pace which would tire anyone out. The Mule got a special wrap treatment which features a hybrid of automotive paint grade color change film, along with digitally printed matte vinyl spot graphics. This contrast of finish makes for unavoidable high end advertising on this 4 wheeler on steroids. Many folks may believe that due to it’s size- this is an easy wrap. The opposite is actually quite true. An extensive amount of disassembly, along with very intricate small shaping of all the plastic panels make this a labor intensive endeavor. We calculated that we regularly fully wrap full size cargo vans in the same or less time than was invested into this UTV. Nonetheless, these Mule wraps are usually not a very low cost project. The base Allentown wrapping on the Mule was comprised of 3M’s premium 1080 series Cosmic Blue. The high gloss metallic finish on this film offered a super vibrant look. We then matched this up with 3M’s premium IJ180MC digital print film and their 8020 matte laminate, which created the contrast mentioned earlier.